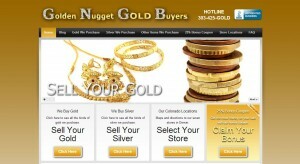 Golden Nugget Gold Buyers address, phone, website, and more. Golden Nugget Gold Buyers pays the highest prices in Colorado for gold and silver. And we prove it with our 110% guarantee. Make sure to read this entire page for details. You might be wondering what else makes Golden Nugget Gold Buyers the smart place to sell your gold and silver. Here’s what sets us apart: Golden Nugget Gold Buyers has professional buyers (licensed by the city in which they work) thoroughly examine and test every piece brought into our stores with a strict, 3-step process. This is important because there are many different kinds of precious metal jewelry, including those mixed with other metals and gold plated or gold filled items. This can significantly drop the value of the piece, so when a purchasing business doesn’t thoroughly test what they’re willing to buy, they will pay out far less overall to cover their margins. If you have genuine gold or silver, this means less money for you. Golden Nugget Gold Buyers determines the amount, weight, and value of all precious metals we purchase, and rules out anything not genuine. This ensures we can pay you top dollar for your items.